All the basics are covered beautifully with the Amish Pencil Desk. Set up a small office work space with this solid wood desk prepped to perform. The simple style showcases the solid wood of your choice, with nine different wood species to choose from. 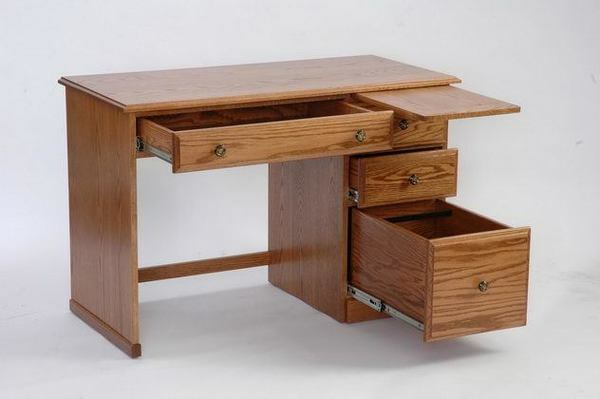 This Amish made desk comes equipped with one hanging file drawer, two storage drawers, a central pencil drawer and a writing board pullout to extend surface space. When you're looking to set up a space to work on your laptop and write out cards and bills, the Amish Pencil Desk is custom made for the job. Like all of our Amish furniture, this solid wood desk is made with skill and precision. Handcrafted in Ohio, you can count on this wood desk outlasting the others. Dovetailed drawers are strong and supportive, while the solid wood promises an attractive form that is built to last. Customizations are at your fingertips. Choose wood and stain along with your style preference, with traditional, mission, and shaker styles to choose from. Browse our wide variety of Amish desks for home offices and business. Please email or call us with any questions. A friendly Amish Furniture Specialist will be happy to assist you. 866-272-6773 The DutchCrafters Showroom is located in Sarasota, Florida. Come see us when you're in the area.